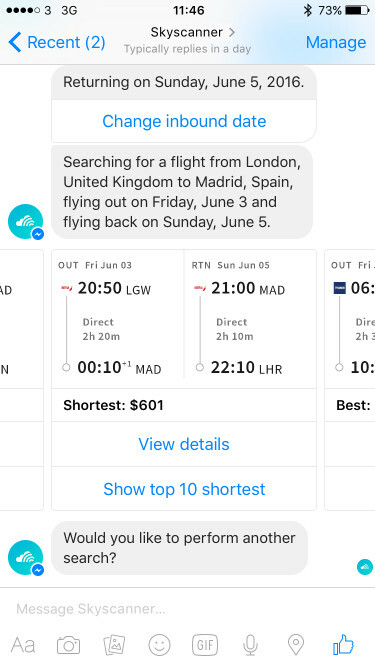 Skyscanner’s travel bot makes searching and booking flights a breeze. 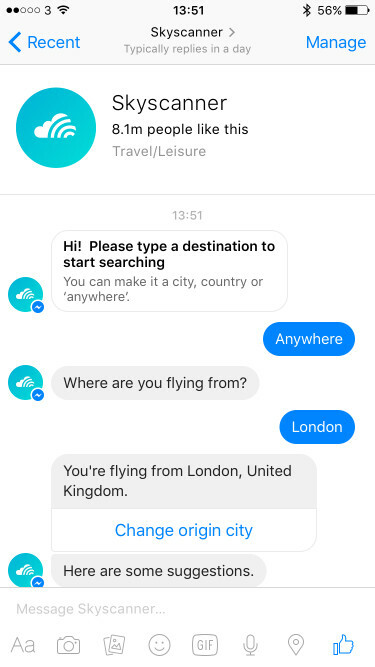 You simply tell the bot where you want to go, where you’ll be flying from and your travel dates. Or, if you’re not sure where to go, just type ‘anywhere’ and the bot will serve up some recommendations for you. Next, you’ll get a list of flight options from different airlines at different price points, as you would expect from Skyscanner. The only complaint at this stage is you have to click ‘View details’ to proceed, at which point you’ll be taken to the website where you can book. It would be nice to have this all happen within the Messenger app but hopefully this was on Skyscanner’s new year’s resolution list. 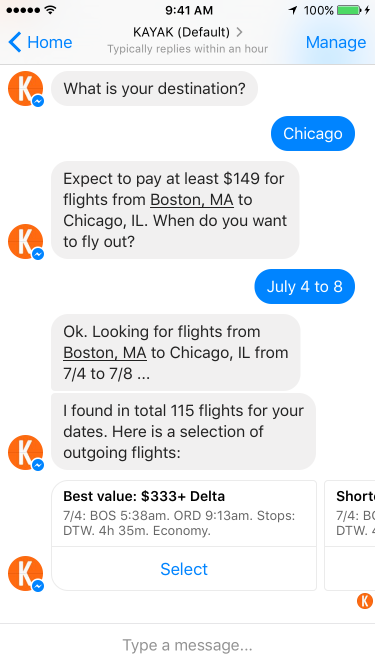 Skyscanner rival Kayak takes things even further with its Messenger bot, providing a much wider range of tasks for the eager traveller. 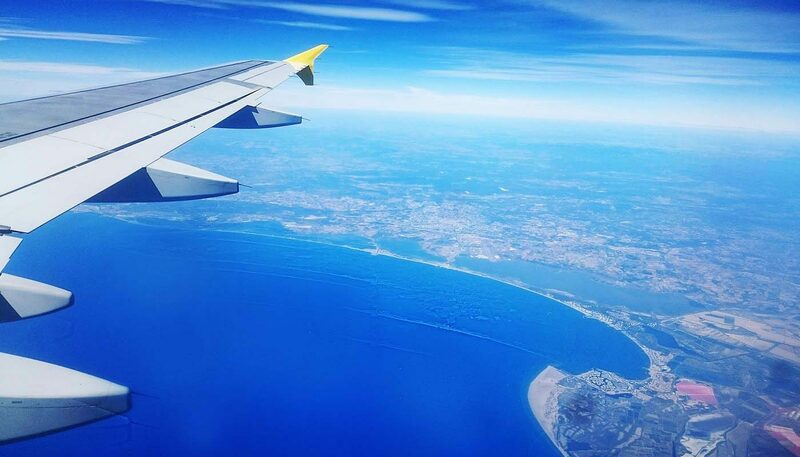 Aside from searching for flights you can also find hotels, rental cars and general travel advice for your next big trip. If you’re on a budget, all you need to do is ask the bot where you can go for a certain price and get a list of recommendations. Not bad, right? You even get live updates on your trip, including real-time gate changes, flight delays and check-in status. 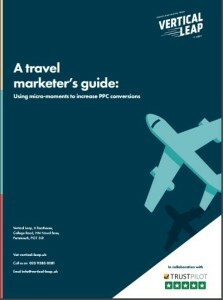 Let’s hope Skyscanner is taking notes. KLM is leading the race among airlines to provide a better customer experience through chatbots. Assuming you opt-in for updates when booking your flight on the KLM website, you’ll get a booking confirmation in Facebook Messenger and also be sent your digital boarding pass in a later message. The Dutch airline also gives you real-time updates on flight status and any changes like gate switches or delays. Finally, you can reach out to KLM at any time via Messenger with general queries or requests – for example, changing your seat number. CheapFlights’ bot does the whole flights and hotel search thing but with added sass. The bot is powered by various APIs which allow it to return results for flights, hotels, weather information and show results based on the user’s location. There’s also an ‘Inspire Me’ option if you’re short on ideas of where to go. This chatbot is about as smart as you’ll find on Facebook Messenger right now. It can understand lengthy queries like ‘get me cheap flights to Madrid leaving next week and returning on the 8th of March’ without even breaking a sweat. It even does banter pretty well. Seriously, if you haven’t already, check out the video to see how the CheapFlights bot handles smartarse users (with suitably triumphant music in the background). 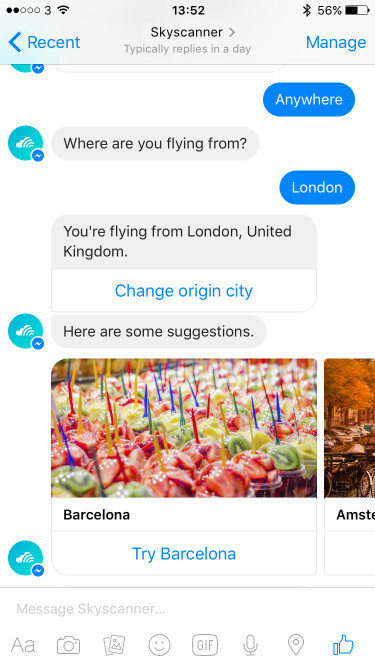 So that’s our pick of the best travel chatbots so far and we’re looking forward to what’s ahead for the rest of 2017. All the bots on this list happen to be running on Facebook Messenger and you can see how much the complexity varies among them. 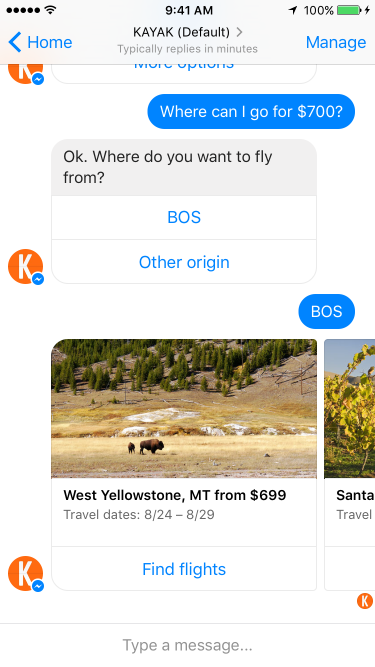 Facebook is already one of the strongest marketing channels for travel brands but chatbots are turning it into a mobile travel agent where people click to book. If you’d like to learn more about chatbots and AI assistants, come along to our seminar on 2nd November 2017 in London. We’ll be talking about the future of travel search marketing in the morning with guest speakers from Google and Sofitel and running a conversational UI workshop in the afternoon.